You can be certain that it’s really cold outside when your dog pokes its head out the front door and then quickly, without even venturing forward, retreats back into the comfy confines of home. But while your pet can be forgiven for its reluctant to brave bone-chilling temperatures, it still needs the right amount of physical activity since a sedentary lifestyle can lead to health issues. First things first. You can’t keep your dog inside all winter long since fresh air is good for man’s best friend. When it’s nippy outside, just be sure to outfit your pet in doggy clothes, jackets, and boots that are suitable for the weather conditions. And limit the amount of time spent outdoors. When you can’t take your dog outside as often as you’d like, you have to get creative. So, what follows is a look at a number of fun indoor activities with your dog this winter so that your pet can stay fit, engaged, and happy during the cold weather months. If you're looking for a fun indoor activity that will stimulate your dog mentally, than the shell game will do the trick. All you'll need for this easy problem-solving game are three cups and a treat. Turn the three cups upside down on the ground, place a treat under one of them, and shuffle the cups around. When your dog finds the hidden treat, be sure to praise it and let it eat the treat. If you don't have a Kong toy -- or something like it -- for your dog, go out and get one. 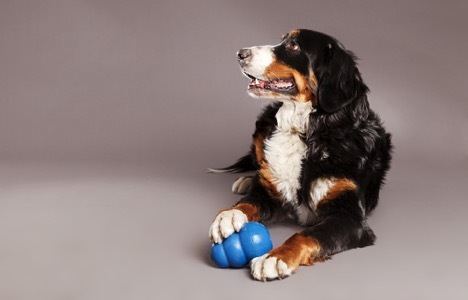 You can stuff a Kong with some of your dog's favorite snacks, and then give your dog the delicious challenge of retrieving the tasty eats from the toy. For a fun treat idea, try placing some frozen peanut butter into the Kong, and then let your dog have at it. 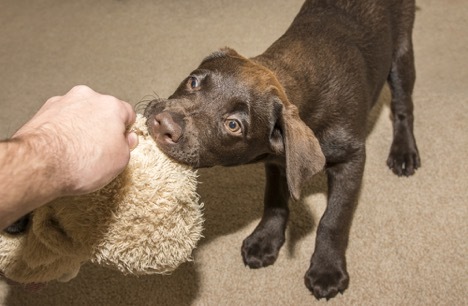 You've probably already discovered that dogs love a good game of tug of war. You don't need any fancy apparatus to play this fun indoor winter activity. If you have an old towel or your dog's favorite toy, that'll do just fine. Grab one end and have your dog grab the other end with its teeth -- and then let the tug of war begin. Be gentle, though, so that you don't hurt your dog's teeth. Hide and seek isn’t just something you can play with your kids; it’s something you can also play with your dog. Give your dog the command to “stay” or “sit” and then go and hide somewhere. Make sure that it’s a place where your dog can safely and easily access. After you’ve found your hiding place, command your dog to “come” or call its name. You can give some verbal cues if it’s heading off in the wrong direction, and be sure to reward it with praise and a treat when your four-legged Sherlock Holmes finally tracks you down. While the game of fetch might be more fun in the backyard or at the park during the summer months with its balmy temperatures, your dog can have a great time playing the same game indoors. Whether in your living room or in a hallway, get one of your dog's balls and toss it so that your pet can scurry after it. Your dog will be engaged and entertained during this activity. Again, don't let winter stop you from giving your dog the exercise that it needs to be healthy. There are a lot of potential health problems that your dog can develop if it fails to get enough physical activity, so keep it active indoors when the cold weather limits its time outdoors.